We all knew the law. Ethan’s Uncle Mark had made the proclamation broadcast across the city, announcing new laws had been passed to stop the sans-merci, to give the Light guards the power to crush them.The guards would use that power to kill Ethan, unless I stopped them. “The guards of the Light don’t take bribes,” the guard said. There was the long, slow scrape of a train-car door opening. Standing framed in the doorway was a doppelganger, his face shrouded by the doppelganger’s dark hood, fastened with the enchanted collar. “I heard there was a witness who saw the accused consorting with a member of the sans-merci,” he said. “I just have one question.”The doppelganger threw his hood back. This was Ethan’s face. This was Ethan’s doppelganger—his exact physical double. Society is divided into the City of Light, maintained by Light Magic, and the City of the Dark, "the buried," powerless and poor, dominated by the dark magicians. Ethan's family, the Strykers, rule the Light City, but they have a dark secret: as a baby Ethan's life was saved by the blood of a created doppelganger, hooded and bound by a dark magic collar. Lucie, too, has a dark past, saving her father with her own magic from the Cages where blood was drawn to nourish the magicians of the Light, celebrated as the Golden Thread in the Dark, but used by the Strykers to keep the Dark City pacified. But Ethan and Lucie love each other deeply, and when on their way back to the City Ethan is seized as a traitor, he is saved from instant execution by the intervention of his double. The law states that an eyewitness' story can't count against someone who has a doppelganger, and when Ethan and Lucie are released, the Strykers use their power to protect Ethan and suppress the doppelganger's own story. Lucie's sympathy for the doppelganger Carwyn leads her to free him impulsively from his collar, even though he warns her that he has no soul, only evil within. Lucie's liberation of Carwyn is emblematic of what is happening in the greater society. The revolutionaries of the Dark, the Sans Merci. break free and are relentless in their movement to overthrow the reign of the Light, and despite their glowing city and merciless guardians, that revolution inevitably begins with a slaughter of the ruling class. They brought out more of the Light Council, one after the other and killed them before our eyes. The blood fell like rain and caused a joyful riot. There was no escape from the ugliness in the human heart, the hate that led to this violence and all violence. Both the City of Light and the City of Dark are set afire by the rebels, and Ethan is seized and set for execution by the Sans Merci. Despite her powers of light, Lucie cannot save him. But again, Carwyn steps forward to substitute himself as he did on the train platform. His grip on the dark cage was firm. He looked bright and sweet and new to the world. He looked like no one but himself, like a self he had never been before. I know he did have a soul. 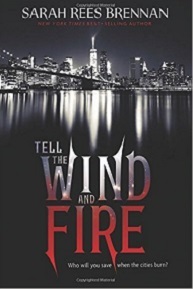 Sarah Rees Brennan's forthcoming Tell the Wind and Fire (Houghton Mifflin Clarion Books, 2016) artfully twists the plot of the classic A Tale of Two Cities (Dover Thrift Editions) around her tale of a dystopic society's decline through class warfare into the chaos of rebellion, a story line with parallels in current life. Magic in this novel is mostly metaphorical, in the classic antithesis of the Light and the Darkness. But Brennan's people of the Light are no angels, merely a fortunate and fabulously wealthy few whose hegemony is maintained through brutal use of dark magic, actually and symbolically drawing upon the blood of the people of the Dark as well as their labors to remain in power. Among these "illuminati" there is a glittering way of life, but one maintained by brute force and suppression. Lucie, as narrator, is herself the one bridge between the two cities, and Brennan chooses flawed characters, Carwyn, whose name means "Blessed Love," and Lucie and Ethan, their very names yet meaning "Light" and "Strong and Wise," to be charged with reshaping their society. Brennan's writing is not hindered but rather bolstered by the weight of metaphor and its now familiar genre of dystopia society and rebellion. This novel draws on deep roots that will be familiar to young adult readers on some level to tell a rousing story of love and conflict for power that never flags. See the book's trailer here.